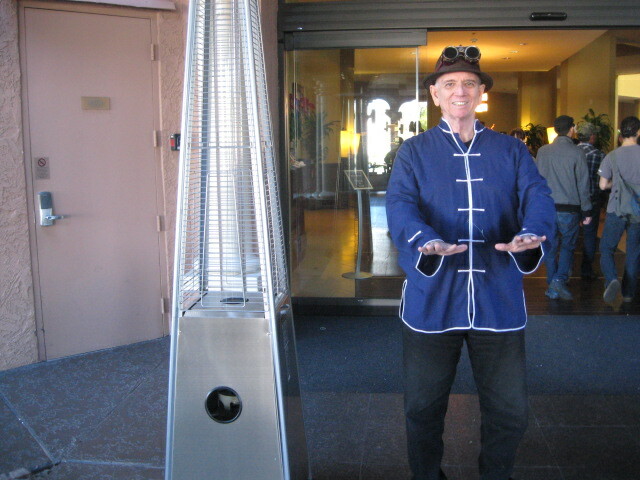 Ken St. Andre, steampunk tai chi master, passes through the Gates of Steel to enter the World of the Weird. 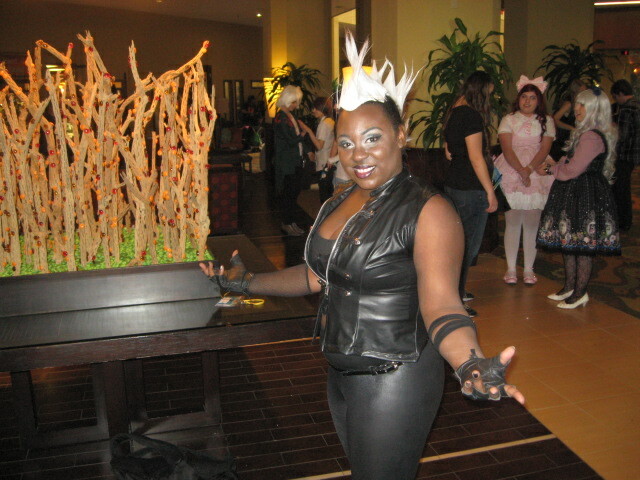 I love hall costumes. Not enough to really get into that scene myself, although I would be totally willing to wear great costumes that others made for me, but enough to appreciate and enjoy it when the costumed folk surround me. 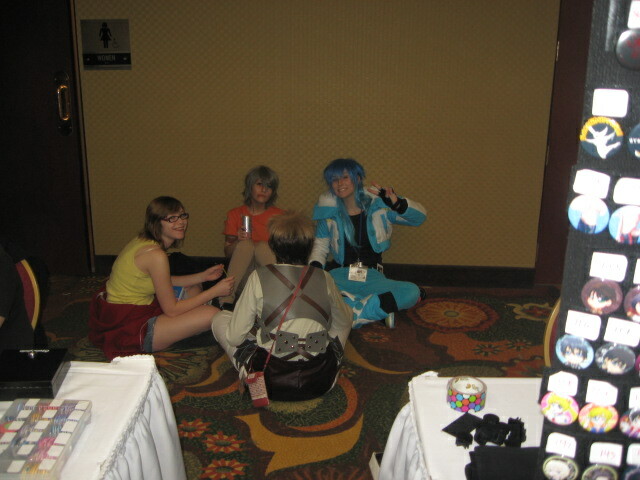 Last week there was an anime con in Mesa, Arizona. I thought about attending but decided to only go on Sunday, and to only go to see the cosplay. 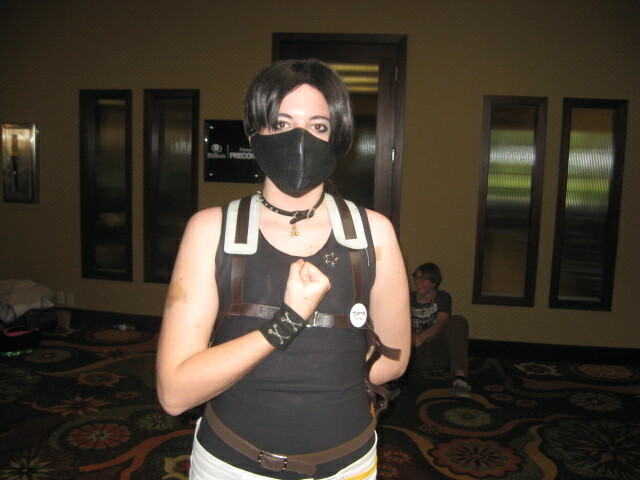 I am not much of a fanboy for any particular anime, but at least the costume I wore made me part of the cosplay crowd, and made it really easy to talk to them. I took my camera along and this is what I found. 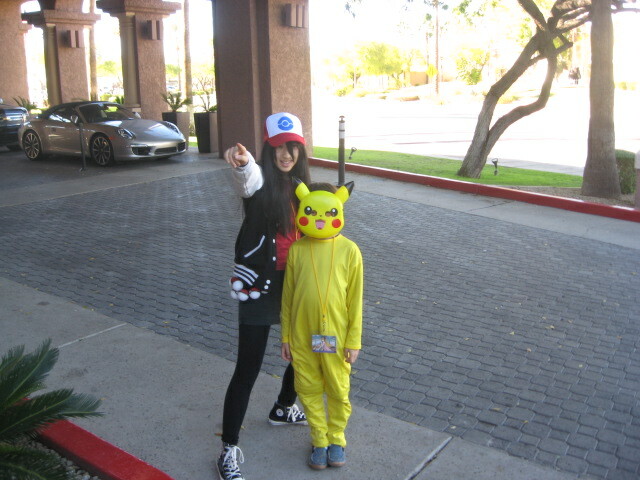 Pikachu and Ash were there. Far future assassin. Awesome weapons and armor. Glad I was not his target. Avoiding the old joke about horny ladies, I will say these pretty devil girls seemed very happy not to be in Hell. A cat may look at a queen, and I looked at this one. I believe Wonderland is getting more psychedelic than Carroll’s Wildest Imagination. 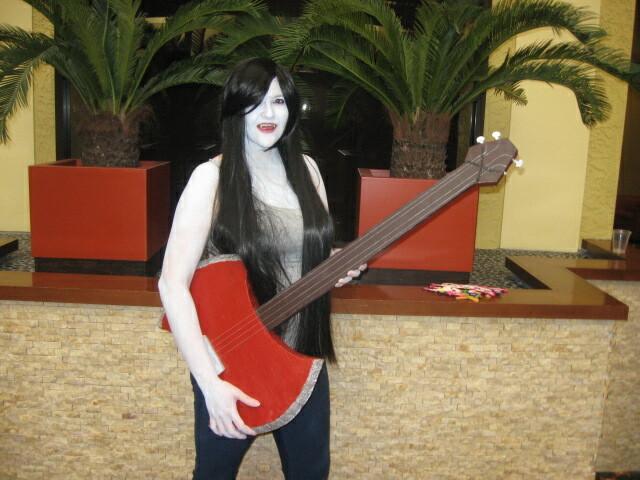 And speaking of queens, here’s Marceline, the Vampire Queen from Adventure Time. 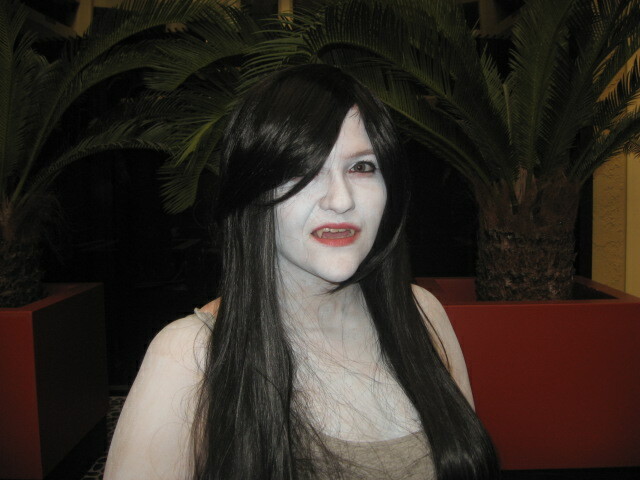 I really like the vampiriness of her costume, so I got this closeup to show her teeth. She doesn’t have to drink blood–she just eats the color red. Getting her teeth whitened wouldn’t hurt, though. Kill La Kill–a high school frull of killer girls. 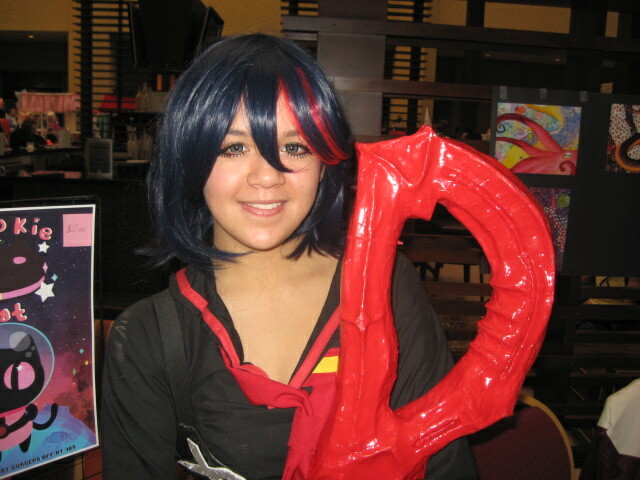 Our heroine is Ryuko Matoi who wields one half of a giant pair of scissors. 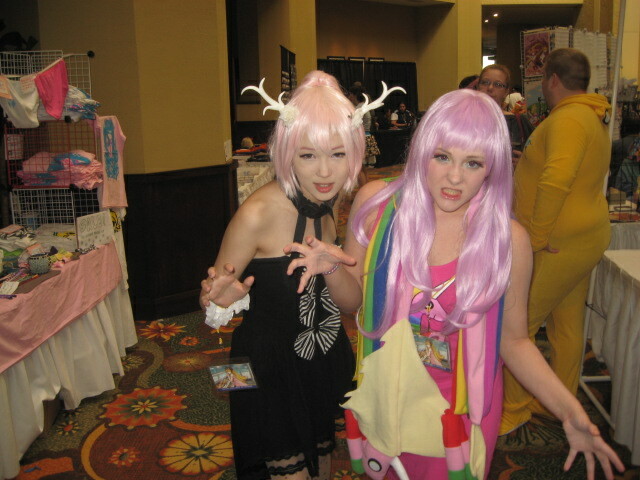 Although cosplayers live to be photographed and complimented, many of them have no idea how to pose. 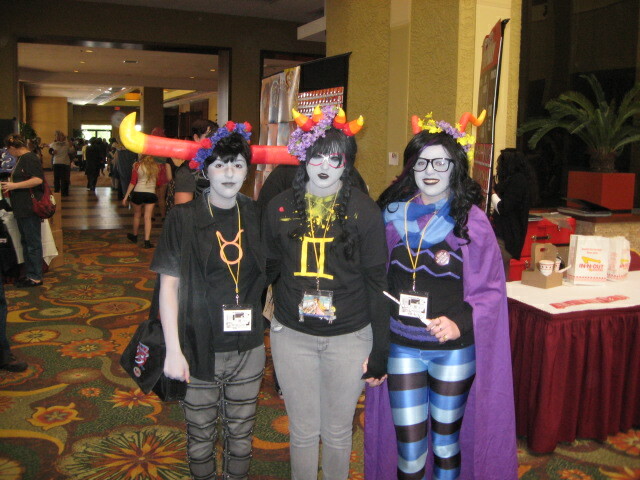 This is the Before I got them to actually do some cosplay. Sometimes you just want to chill with your friends. 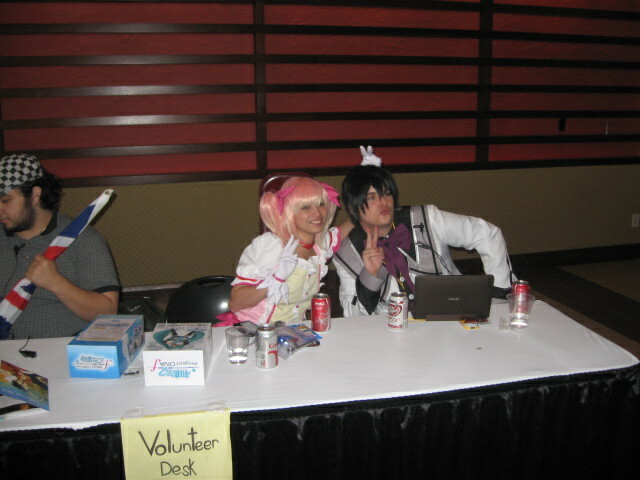 Hanging out at Taiyo Con. 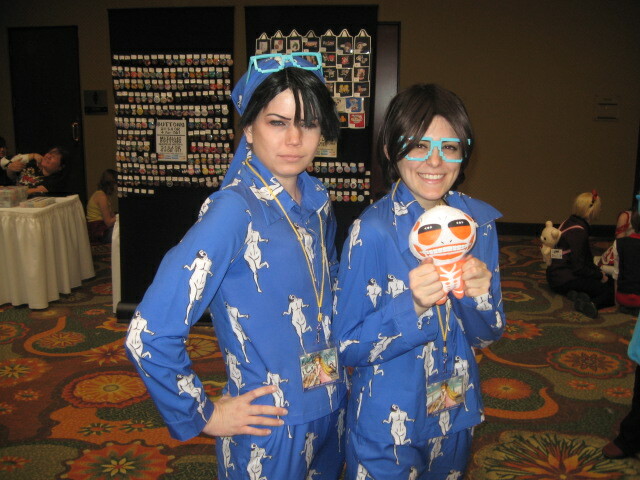 Are these girls wearing the scariest pajamas ever? The humanoid figure you see on their clothing is a titan from Attack on Titan. From the huge to the tiny. When I left the Titanic twins behind, I met this radiantly beautiful fairy. I asked about the mask. She just likes to wear it. I tried the line from the Princess Bride on her where the Dread Pirate Roberts defends his mask by saying he thinks it is very fashionable, but it went right by her. 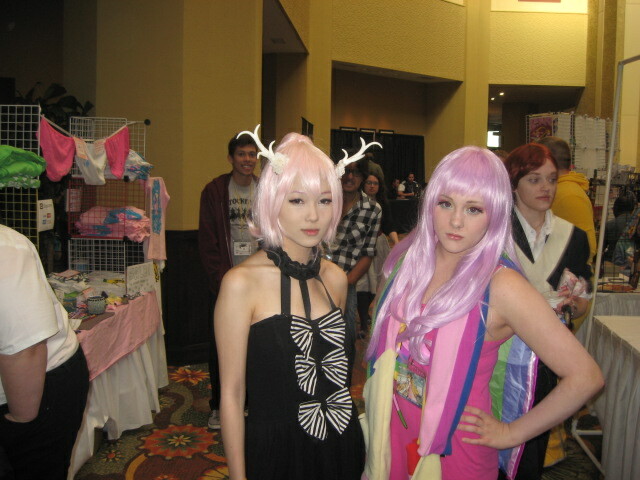 The girl in pink was standing with the girl in black when I took her picture, and wanted to be photographed too. I mentioned (lol) how dangerous they looked, and whispered to Pinky that she was the one who really terrified me. That really made her smile and she said she liked me. Not all of the dangerous characters and great costumes were worn by women. 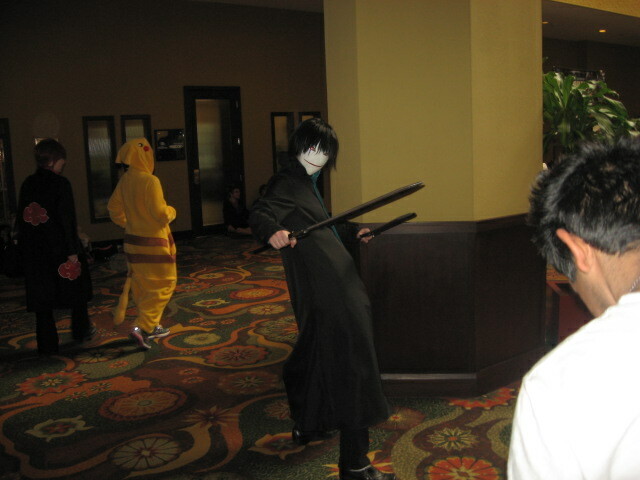 This guy with his twin swords was posing almost nonstop, often with ladies who liked his killer looks. Deadpool was there. He seemed to be mostly a beast of burden for the girl he was with, but he had the better outfit. Heh, it would have been great to get him into a faceoff with that furure assassin character or maybe the ninja up above. 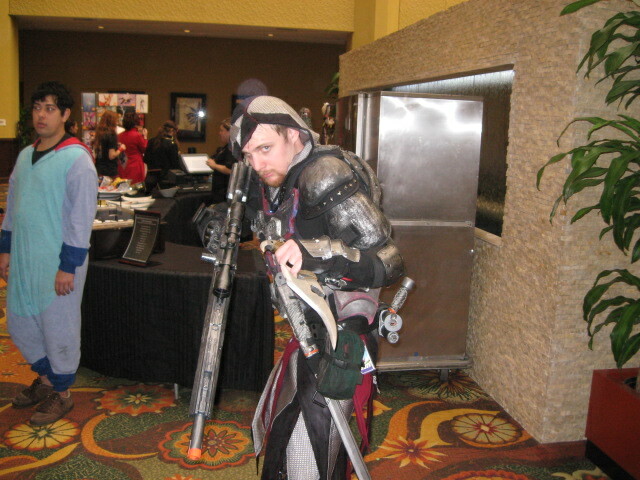 Here’s another guy with a suit of armor I’d really love to own. 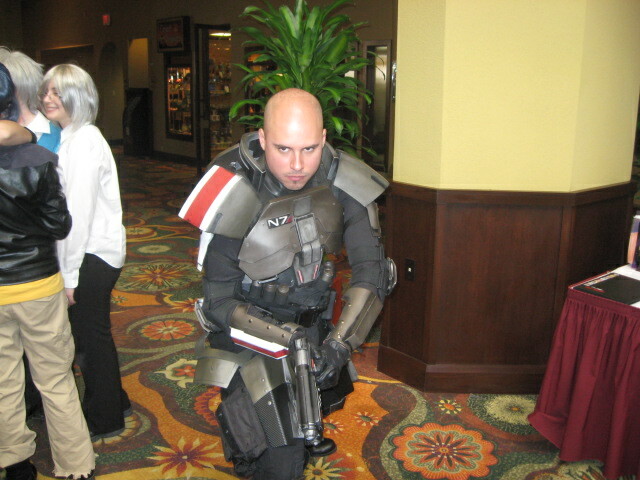 Maybe he’s supposed to be Riddick, or maybe he just likes the bald look. I kind of like it myself. The Lady in Red was a vendor selling elf hats from the Legend of Zelda. I came within an inch of buying one, even though I can’t think of any reason for ever wearing it. Simple but cool. The newly-dead don’t all lie down and molder. This one was ready to defend herself and had the cutest freckles and engaging smile when caught off-guard. Short, blonde, female Naruto, but dangerous all the same. I truly love the dangerous ones. I showed her this tai chi guard and push posture to get her into action instead of just portrait mode. Knowing some tai chi has its benefits. 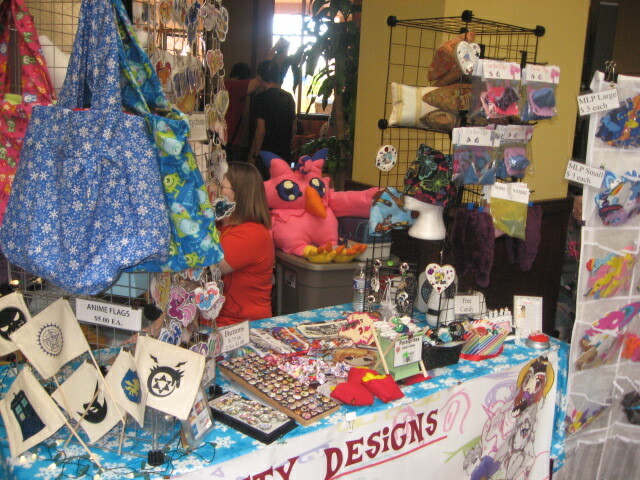 Is that an owlbear I see lurking in the background? 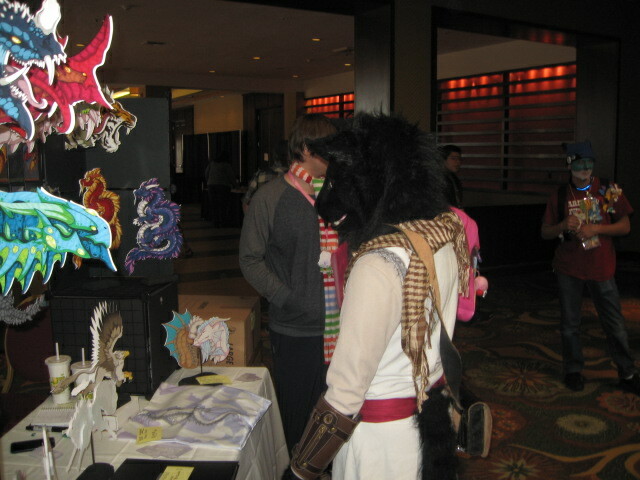 Very handsome wolfman–I didn’t ask him to pose, just caught him going about his business. 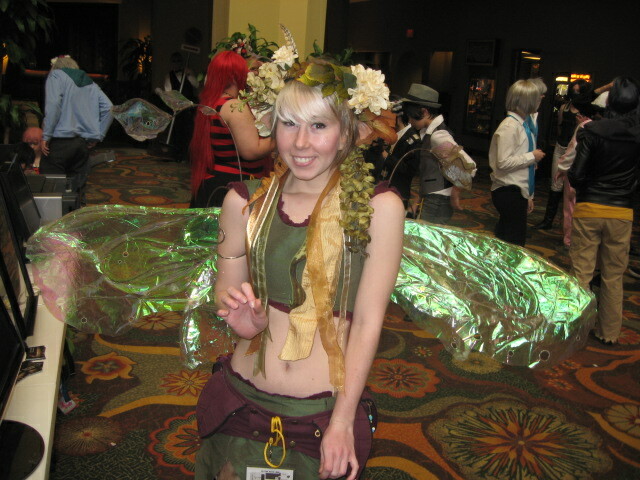 Rushing into the Dealers Room, she stopped to let me take a photo, but she forget to smile. This is what happens to beautiful young anime characters once they get middle-aged and world-weary. Volunteers make any convention run. These kids were in costume and doing their duty, even tho the need for volunteers was mostly gone by Sunday afternoon. I salute Con volunteers everywhere and thank you for your time and effort. Colorful. Great hair. Has a boyfriend. Storm of the X-Men was blowing in as I was blowing out. Maybe she’s here. 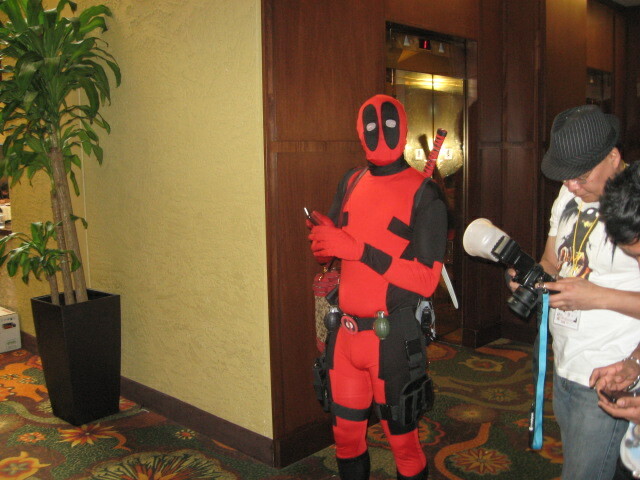 to apprehend Deadpool. She certainly looks ready for action. And that’s all, folks. 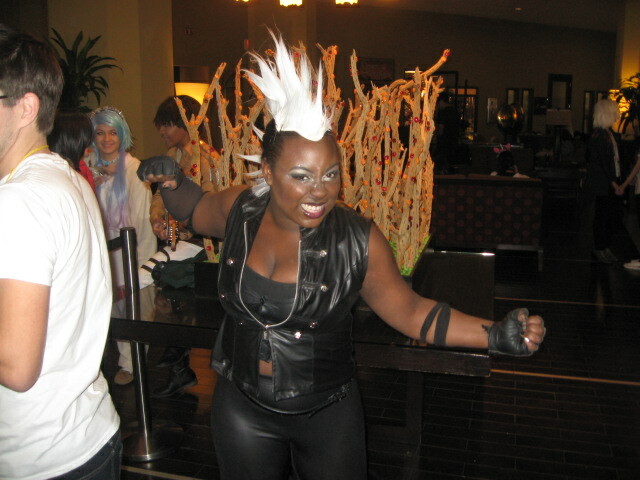 I am sure I missed some great costumes, and didn’t go to any panels or see any of the anime stars on hand, but I had a fun hour taking pix and talking to the people in the lobby. I don’t know if Con promoters and producers would want me to say this or not, but people, hotel lobbies are free. 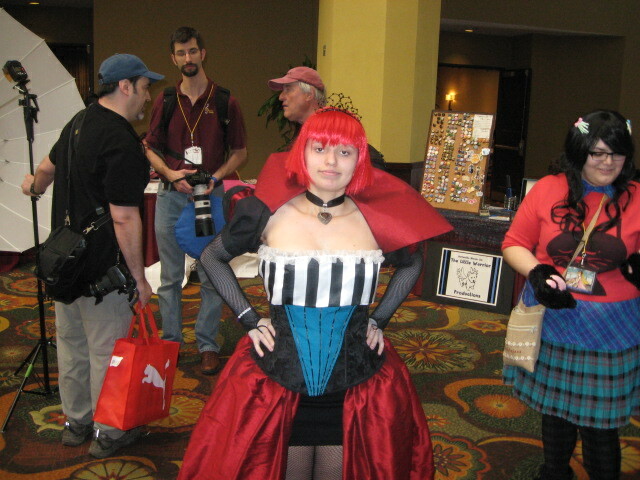 If you can’t afford to pay the high prices of attending today’s many sci-fi, fantasy, media, anime, comics cons, you can still go and hang out in the lobby where you may get a chance to talk to the participants, see great costumes, take some photos, and otherwise enjoy yourself. It is a lot better than staying home and playing computer games all afternoon–though there is nothing wrong with playing computer games, and I play a lot. 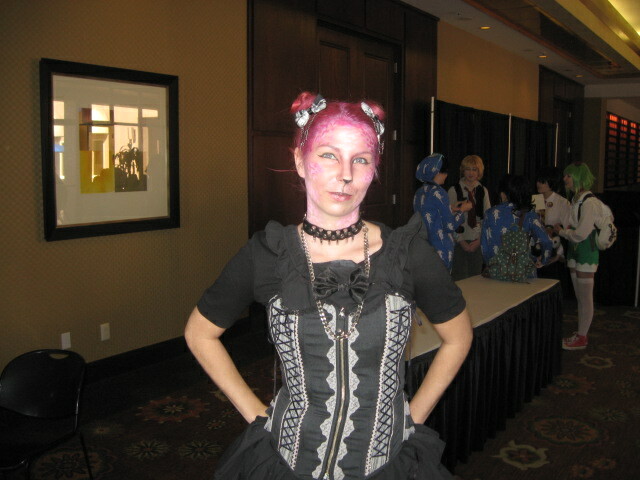 Next weekend I will be a gaming guest at DarkCon 2014, and I think I’ll wear my steampunk tai-chi master costume again–at least for one day. I will be doing a panel on Saturday morning with three other more notable game designers than myself (Tom Dowd, John Wick, Todd VanHooser), and I should be running some Tunnels and Trolls for anyone who would really like to play. Bring your characters and your dice and come game with me! You can learn all about DarkCon here: https://www.facebook.com/events/162229360629080/. 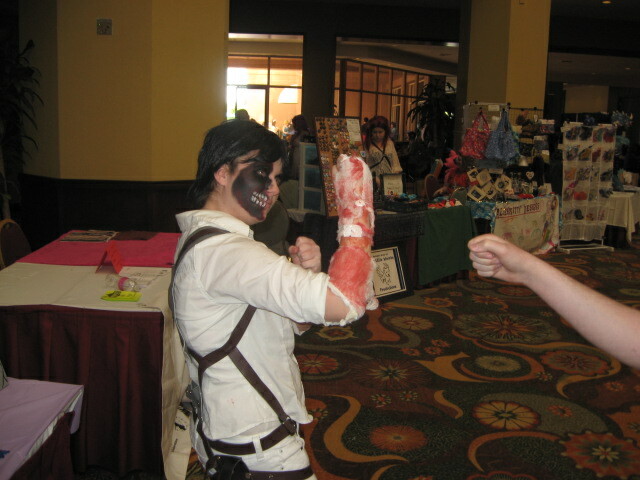 I will be taking pix, and should have another Con report here in a week or ten days. 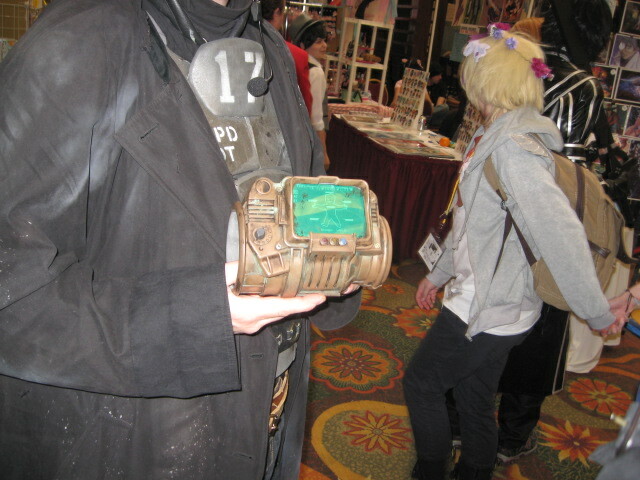 If you ever indulge in cosplay, or take pix of those who do, why not leave a comment? 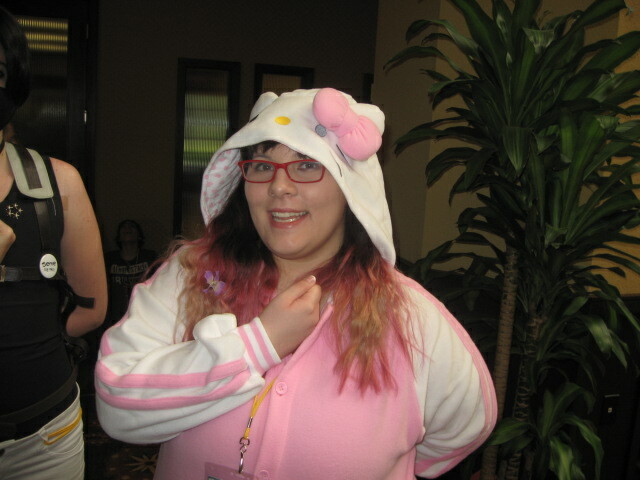 If you were at Taiyo Con, you should certainly leave a comment and tell what was best about the Con for you. 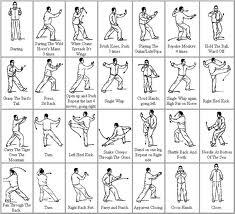 For the last nine months I have been studying Tai Chi with David Block at Phoenix College. I am not a good student. I have neither grace nor balance nor dedication, but I do what I can. The things I know with my head don’t translate that well into the things I know with my body, but I try, and I am learning some things little by little. I still can’t flow all the way through the first set without making mistakes or putting my foot down in the wrong place, or lifting my shoulders when I should be lowering them or falling over backwards when I should be rising and kicking forward, but I have moments when I almost feel I understand parts of what I am doing. The teacher is very patient, and he has to be with a student as poor at this as I am. I think I will always be a better writer than a martial artist, but I do what I can. Lately I have been inspired by my exercises to reconstruct this poem–I do not know if some Tai Chi master has already written the Tiger Mountain poem or not. Perhaps for them it is simply a series of phrases used for teaching their disciples. For me, it is more of a poem, and it has to have a story. Story is very important in my life. I cannot just Be. I must Do. I must Create–even if what I make is only a sequence of words in my mind. Still that is who I am and what I do. Out of Tai Chi, this poem has arisen. I put it out there in the world because it needs to get out of my mind and into reality. Ceifu talks about old friends and new friends and how we students are all babies in Tai Chi, taking baby steps. 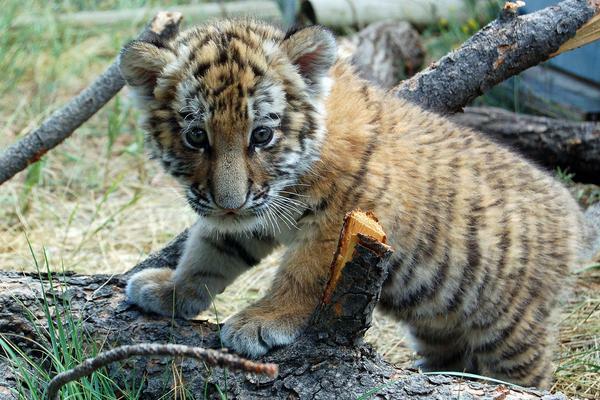 Thus my image of myself as a baby tiger. Strange for an old man like myself to be a baby, but then, I want to be young, so I can dream myself as a tiger cub. The sun rose over the mountain. The moon sank into the sea. Clouds sailed through the sky. Until peace came at last. So many forms to learn, and when we do, still we know almost nothing. If you do Tai Chi, or have met a tiger on a mountain, feel free to leave a comment here.